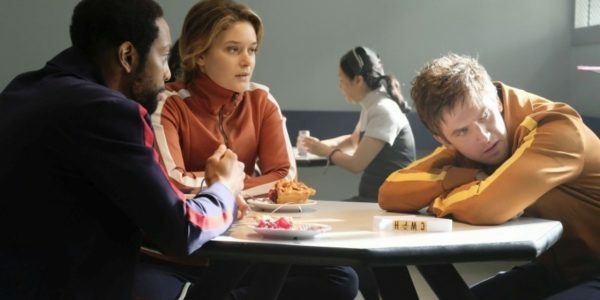 A lot of strange things have happened throughout the first five episodes of Legion, but "Chapter Six" kept the narrative bells and whistles to a minimum while working through a well-worn TV trope. Throwing the show's main characters into Clockworks (albeit an Astral Plane version of Clockworks) made for a fun twist on the "throw a character into a mental institution for an episode and make the audience question their reality" trope, so often used to make characters and audiences doubt the reality of the show. And while it was pretty clear from the end of "Chapter Five" exactly what was happening, it was still pretty disconcerting to watch normally strong and forceful characters like Melanie or Kerry flounder in their new environment while being forced to deal with their own personal fears and past trauma. Seen through Lenny's twisted psychological diagnoses, it's not too hard to explain away each mutation as a mental issue. Ptonomy is fixated on the moment of his mother's death, which helps explain his ability to climb through the memories of others, as he cannot seem to move beyond a single memory of his own. Kerry and Cary have an unhealthy attachment. (How heartbreaking was it to watch Kerry realize Cary had left her alone, just as she feared?) Syd intentionally isolates herself from those around her out of a fear of getting hurt, rather than a fear of touch. And the Eye (or, it appears, Walter) has an inferiority complex in his own appearance, so he takes on the appearance of others. Sure, they are pretty spot on, but it does give one momentary pause to think that perhaps there is more going on than just mutant powers. But, alas, we know better, and we know that this is just a massive hallucination to buy Lenny time to fully take over David. And let's take a moment to discuss Lenny, shall we? I'll admit to not really knowing what to make of the character over the last several weeks. But I think this particular showcase for both the character and Aubrey Plaza makes it pretty clear that Lenny is not what she has seemed throughout. Yes, last week we learned that Lenny is just one manifestation of whatever ancient mutant is hitching a ride on David's mind, but "Chapter Six" really gave us a look at how powerful this mystery mutant is. We know that David's father, Charles Xavier apparently gave David up to keep him hidden from Lenny and protect him from what Lenny could do both to him and with his powers. But we also now know that David is far more powerful than Lenny ever imagined he would be, making this particular partnership even more lucrative that Lenny thought it could be. Which is particularly troubling. With Lenny now fully in control of David, I suppose we'll get a real taste of Lenny and David's combined powers. I can't see that ending well for anyone in the world, especially considering what happened the last time the two teamed up to take on those who sought to harm David. The only thing I'm having some trouble with is how the show can get the rest of Team Bird out of the dire situation they are in. Waking them up and bringing them back into the real world is the easy part. Getting them out of David's clutches and saving the world? I'm not sure that can be accomplished in the two episodes that remain of Legion's first season. I suppose that makes it a good thing that FX officially renewed the series for a second season yesterday, right? Final Thoughts: -- How cool was that Lenny montage set to "Feeling Good?" The series has done a great job of matching music to scene, but that might just have been the best one yet. -- It was really strange to watch Melanie wander around without control or a purpose. Jean Smart made it seem like a normal extension of the character. She's just so good. -- That interaction between Kerry and the Eye was pretty creepy, no? I suspect it's something that will pop-up again down the road. -- I felt that Kerry the Badass was a pretty one-note character. I was happy to get to see Amber Midthunder get to explore more emotions and her own acting range with this much less tough version of Kerry.